Latch and Batchelor were invited to attend the Live Wire Health & Safety Awards 2014 held on the 2nd October 2014 at Tata Steel in Scunthorpe and to present their application in relation to the work the company had done in developing its new Service Centre. Latch and Batchelor have undergone significant investment in a new Service Centre in order to increase capacity in its Crane Rope division. At the same time as increasing capacity the aim was to incorporate new methods of material handling in order to reduce accidents, work fatigue and improve overall quality. Shop floor operators were involved and consulted with along the way to achieve the best all round approach. Latch and Batchelor was shortlisted and following the presentation were delighted to be awarded first place. 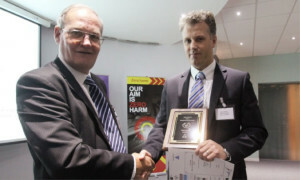 As a result Latch and Batchelor was awarded a commemorative plaque and received a cheque for £1200 from Industrial Training and Development Ltd (www.industrytraining.co.uk) a sponsor of the Live Wire Health & Safety Awards. Mike Liddington receiving the prize from Mr Colin Greenwood of Industrial Training and Development Ltd.
Live Wire is an initiative of the UK Steel Wire Health and Safety Committee and has as its objective the reduction of accidents in the UK wire industry. 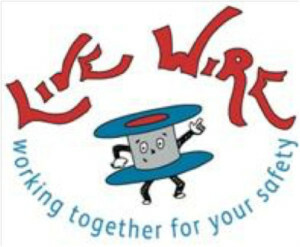 Live Wire wants everyone from top management to shop-floor to get involved in reducing accidents and the initiatives taken will address people issues. The Live Wire Award for Health and Safety award is for the person/team should have come up with an innovation which has contributed to accident reduction at their company/site.